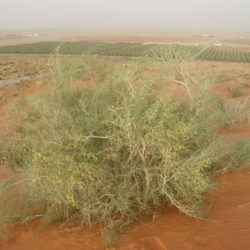 An almost leafless, evergreen shrub with many stiff, upright branches, this plant is widespread in the desert and arid zones of Saudi Arabia, where it is known in Arabic as abal or arta. It is characteristic of deep sand, has a very long tap root reaching down to the water table and helps to stabilise the surrounding dunes. It is often seen growing in a hummock with the sand collected around it: it also occurs in plains and wadis, and is cultivated around desert plantations as a windbreak. 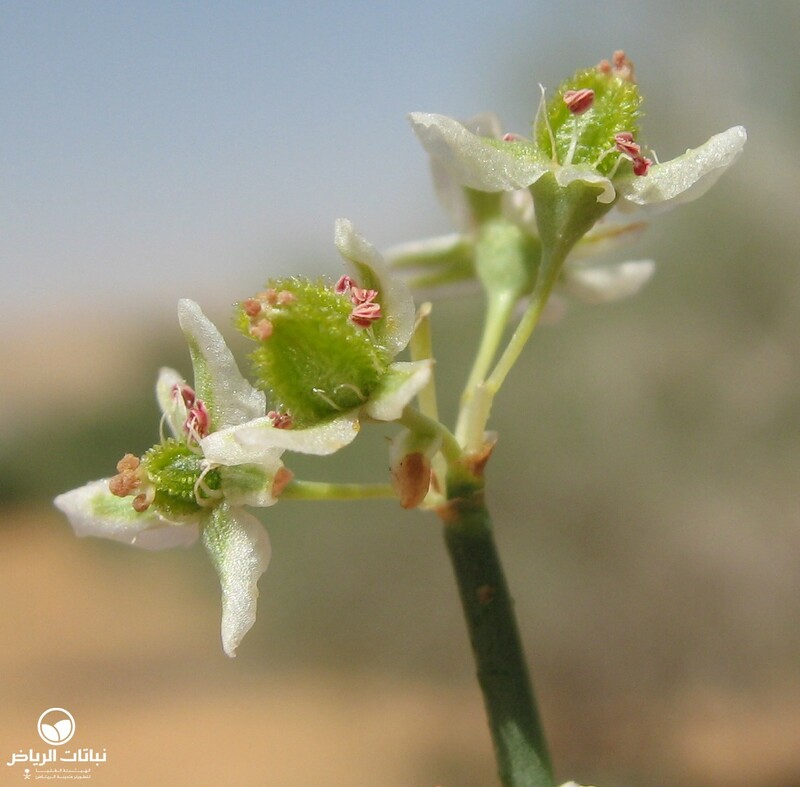 Its abundant, yellowish-white flowers appearing in spring are not only attractive, but also edible and have a sweet scent. 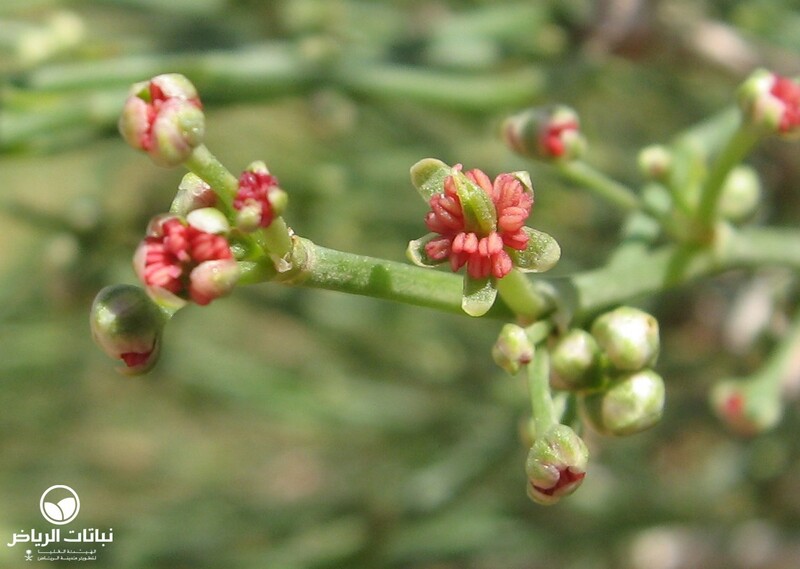 Relatively high, its fragile twigs are slender, the leaves tiny and the pretty, red, oval fruit is covered with hairy spines. 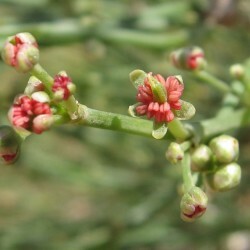 It is fast-growing on sandy and gravelly soils and rock, and is very hardy with a high salt tolerance. Important for grazing, it is browsed by camels. 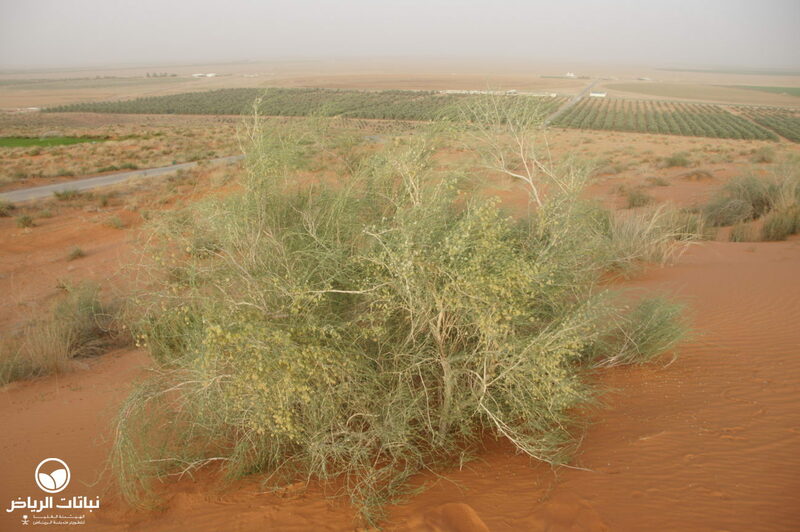 It features frequently in the folk medicine of the desert owing to its food value, high in sugar and nitrogen. 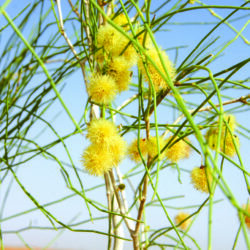 It is used for gastric, ophthalmic and stomach problems, as well as for hair scenting and dying; the dried leaves and stems are used to treat toothache. 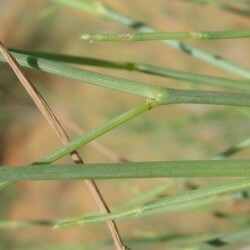 Propagation is by seed or cuttings. 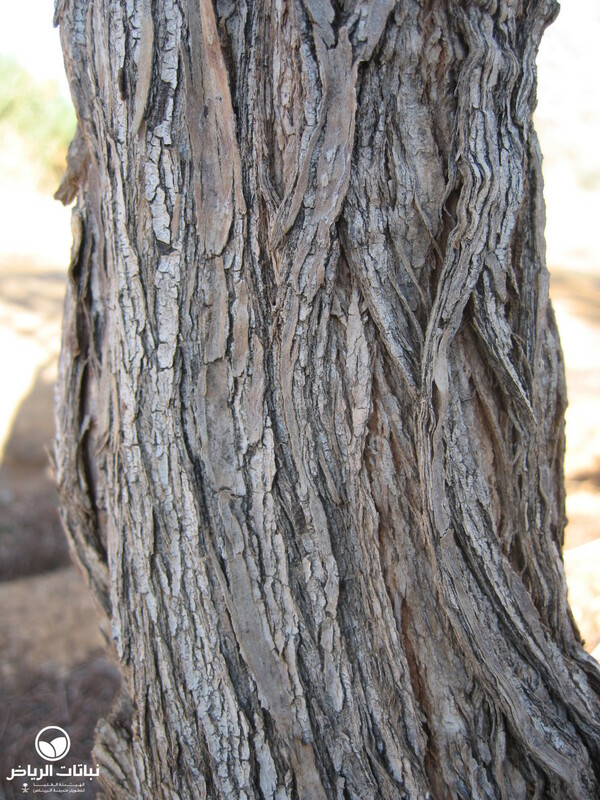 The vertical structure of C. comosum is extremely interesting for landscape schemes, although with age the plant tends to fall over and become untidy. 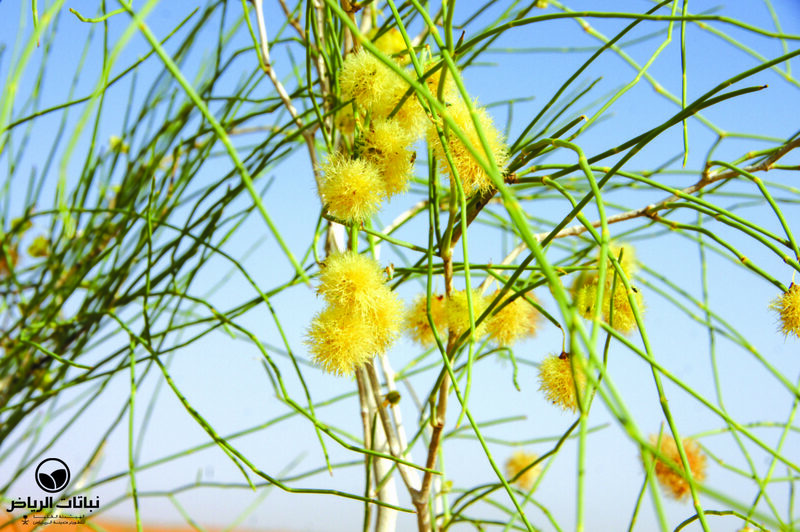 It is a useful plant for sand dune stabilisation, hedges, massed planting and in the foreline of afforestation. 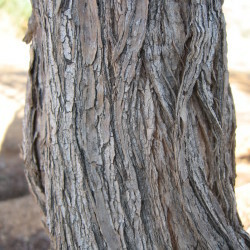 Maintenance is low, and in extensive landscape schemes the plant will look after itself.